Unseen Things: Origins now available! When Jarrod Grant was fourteen years old, some sort of a monster emerged from a portal in his room, grabbed his mother and little brother and then vanished with them back into the portal from which it came. Jarrod, whose father was a soldier that had been killed eight months earlier, was now left completely alone in the world. Four years later, Jarrod is now a senior in high school. No one ever believed his story, and the therapists all said that he’d deluded himself into believing it because he couldn’t deal with whatever horrific events had caused the disappearance of his family. At school, he was treated like some kind of a freak and an outcast. That is, until he met Tina and Sarah – two girls who believed his story and decided that they were going to make it their mission to help him find the answers he so desperately needed. 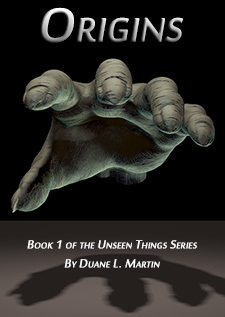 Origins is book 1 in the Unseen Things series. It’s an introduction to the characters, as well as the overall theme of the series itself. It is currently available on Amazon and Smashwords, and will soon be available at the following retailers: Sony, Barnes & Noble, Kobo, Apple, Diesel, Page Foundry, Baker & Taylor Blio, Library Direct, Baker-Taylor Axis360, Flipkart and Oyster. The next title in the series will be called Unseen Things: The Hunt. It is currently in the process of being written, and you can look for its release during the first quarter of 2014. Check back for updates and teasers. If you’re on Facebook, you can like my author page as well. I also have a Twitter account so you can follow me on there as well.